Varun Dhawan’s career has had a lot of laughs and dances with films like Judwaa 2 and Humpty Sharma Ki Dulhania being amongst fan favourites. However, his 2018 releases seem to be taking a shift toward more serious and heartfelt stories. 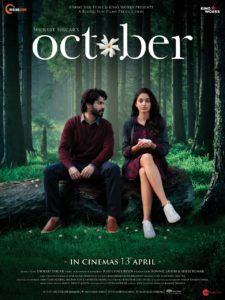 October, is one of those movies. Releasing the 13th April, the romantic drama is directed by Shoojit Sircar, written by Juhi Chaturvedi and starring alongside Varun, Banita Sandhu and Gitanjali Rao in the lead roles. We imagine that knowing a hint of the story that the music for this film is likely to be tender and really aim to toy with the audiences’ heartstrings. This responsibility has been handed to Shantanu Moitra, Abhishek Arora and Anupam Roy all experienced in the art of the love song. Armaan Malik is the chosen singer for the album’s opener Theher Ja. Abhishek Arora provides a background for Armaan to dazzle here with smooth singing of some mildly sad lyrics. There is hope here, but not quite… Armaan finds in his voice the fine line which can be defined as heart-ache and Abhisekh gives his voice the best chance with some light jazz. For those who don’t understand the lyrics, this song is pleasant and seems to be lulling users to a comfortable place to be with its near elevator music stylings. Unfortunately, like elevator music its very repetitive on its tag line “Theher ja tu kisi bahane se”. Next is the October Theme by Shantanu Moitra. Unlike a lot of recent theme songs, there are no words or singers here just an agreeable mixture of strings and piano. The track does sound like something from a meditation app. There is a tinge of sadness from the overriding violin backed beautifully by occasional twangs of a harp. If the aim was to give an audience a mindfulness session, then this song certainly achieves this, but it will heavily depend on how it is being used in the film to give it relevance. Its abrupt end is a shock to the senses, so look out for that. When it comes to thinking about the ‘good old days’ and feeling a tinge of sadness, there aren’t any in Bollywood who can sing this feeling better than Rahat Fateh Ali Khan. Thus, it is no surprise that Anupam Roy chooses him to take on Tab Bhi Tu. Rahat delivers exactly what is asked of him here, giving a beautiful rendition to remind everyone of someone or something in their past, now moved on, now no longer there. A light jazz and classical fusion is the musical style that gives Rahat full hold of the reins of the track. However, even this is subdued so that the listener only needs to listen to the singer deliver his melancholy message. Shantanu Moitra and Sunidhi Chauhan team up for the next song Manwaa. Often the word ‘manwaa’ is used in a playful and happy style to show the breaking of formalities between a new couple. This song is definitely not in that style. Shantanu Moitra gives light acoustic strings mixed with a synth drums background to back up Sunidhi’s powerful vocals. Except for the opening where Sunidhi seems to need more support, this works very well in giving the listener a heart tugging sound based upon the lyric “Sajanwa aaja, naina ro ro thake”. It drifts to a lingering end to leave audiences crying. To round off what is a short album we have Chal by Monali Thakur. Shantanu Motira is again directing this song and since this is light and upbeat in mood, he provides synth pop sounds like Pharell William’s hit collaboration with Daft Punk – ‘Get Lucky’. Similar also in structure this song gives the singer top billing with drums used above the beat to give a driving counterpoint. There isn’t much in the way of lyrics as this is a groove track and a lot of filler is provided to keep the spirit high. To rate this album on its own merits is very difficult as there is little variety or scope for different and special sounds here. From ‘Chal’ to make cinemagoers alive and interested down through the descent into the sad songs ‘Theher Ja’, ‘Tab Bhi Tu’ and finally the heart breaking ‘Manwaa’, coming to a meandering ending with the sleep-inducing theme song, it certainly seems wanting for a remix. However, if the album is looked at in context with the film, it is well written and seems to fit in with the likely path of the storyline. There are no songs for the sake of fillers or random dance item songs which may be perfect as watchers view the story from Varun’s standpoint. Upon reflection and listening to the songs more and more the album is quite good and even had us adding ‘Theher Ja’ to our playlists. We imagine once seen within the story the songs will play beautifully and mean even more. 15 queries in 0.458 seconds.